Location: The river of the arms of God. OK, I said to myself that I was never going to do this , but here I find myself not being able to resist. My 13 yr. son has never had any interest in hydrofoiling. 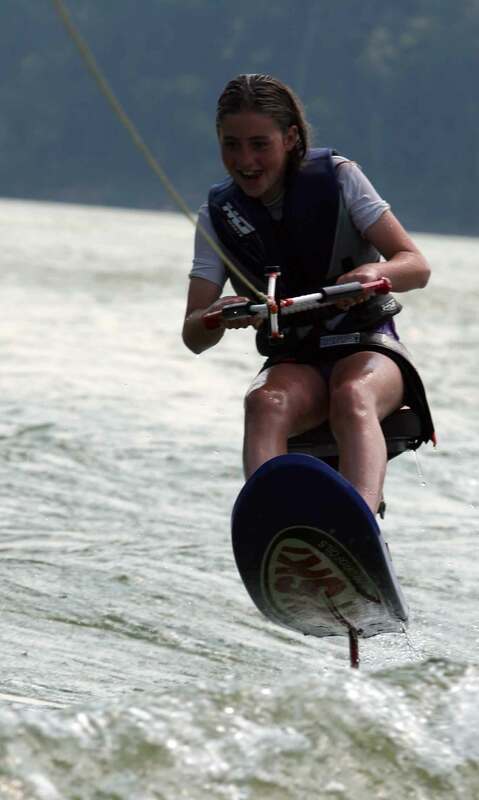 Good slalom skier, good wakeboarder, surfer, ect... I took him to the Texas Fly-In last week and he quietly observed with casual interest only. One of the Team Texas members asked him why he had never tried it. He was embarrased because he did not have a good answer for that question. Late that evening, he ask me if he could try. I thought, great, two hrs. of un-productive dragging was about to be in order, but replied,"OK, if you want". To my suprise, he was up on the third try. A few falls later, he was gaining mastery of riding and flying the ski, crossing both wakes. After a 30 min. session he was done for the day. Two days later, session two, 30 more min. He did extremely well flying the ski without much trouble. At this point he says that he is beginning to get the itch for this. Only one week later, we're back out on the river,and this begins to happen(see pic). Over and over again. Totally in control. I'm simply amazed at how fast he picked this up. Jealous too, because up to now, this has been my sport that no one else in our family could do! But proud as well because the learning curve on these things is pretty slow. Now the pressure is on. I can't let him ride away with an invert before I can. Perhaps some throttle tricks may come into play to slow him down some. Great story and thanks for sharing it! There really is (IMHO) nothing like the feeling of seeing your child tackle some new skill. The light in their eyes is absolutely priceless. Now about those throttle tricks...remember the saying, "Old age and treachery will overcome youth and skill"! brazosvet that's a great story. I can't wait for my son to tell me "dad I want to learn to barefoot" it will be a couple of years yet but I'm ready. I hope my son gets over his fears soon. Sweet pic. One of my daughters wants me to teach her to barefoot. Remembering the facials that I have had, I have been hesitant in teaching her. I believe in not being over-protective, but for some reason haven't put her thru that pain yet. Thanks for sharing the joy!!!! You might consider having Sky Ski put adjustable bindings on the ski board. I'm planning on sending the board in over the winter to have that done. Congrats to your son. Nothing wrong with bragging about your kids. It is way better than bragging about yourself. Great story and pic. One of my four daughters has taken an interest in the foil - she's 12 and like you, I am having a hard time staying ahead of her. (Didn't think of the driving strategy) As you can tell, she likes it! How do you like those Ratchet Handles? Do they stay tight? I've got a set but I hardly ever ride my shock tower and have never put them on. They're great if you disassemble the foil alot. I don't do that very often and find I need to snug them up about every third time out. They're certainly very easy to use- including a quick check after your already in the water. We were out again today. Li'l britches was getting a little bit cocky until a couple of slam dunks took the wind out of him. It's good to see that he is learning just the way his old man did.